Who doesn’t absolutely love, and occasionally as well as legitimately dream about, Tex-Mex food?! This happens to me at least twice a week. Then I stop, reflect and thank God that I was born and raised in Texas. The ingredients in a lot of Tex-Mex food, if utilized properly, are fresh and delicious, not heavy and greasy like you’ll find at most Tex-Mex restaurants. I decided to take these beautiful ingredients and make something along the lines of a taquito, which is traditionally stuffed with ground beef and fried in a tortilla. I opted to go for baked, shredded chicken and baked them in locally, fresh made corn tortillas. It was a test with amazing results. I really questioned how “healthy” these actually were. To confess, they’re not healthy per-say, but they are healthier than the traditional handheld delight. I questioned this because they are mind-blowingly delicious, even with the ingredient substitutions and organic swaps. Not to motion, they are super easy to make and can be made in advance, although fresh is best! Fresh cilantro leaf. I put it inside, before baking, as well as on top, after baking. Chicken breast, baked and shredded. You can use rotisserie chicken for time purposes, but I baked my own cilantro lime marinated chicken breasts. That hint of lime brightens up the whole thing. You can use two forks to shred the meat. On a flat surface place a tortilla and get ready to build your taquito. 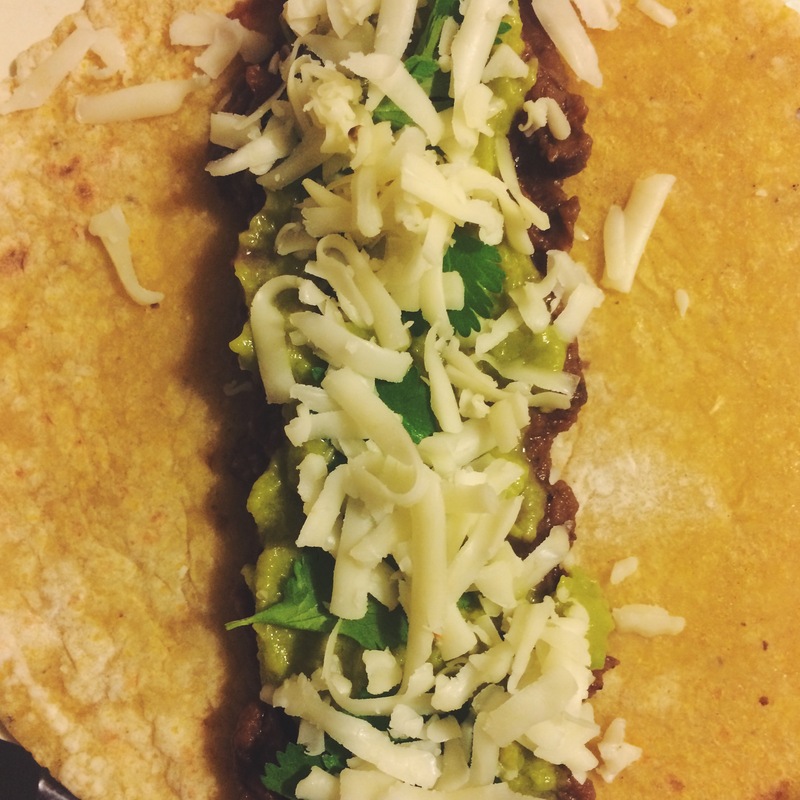 With a spoon going down just the middle of the tortilla, spread the refried beans followed by the guacamole. Top the guac with some fresh cilantro and a little bit of the shredded cheese. Top it all off with the shredded chicken. Remember not to get too heavy handed with the ingredients because you will need to roll them tightly. 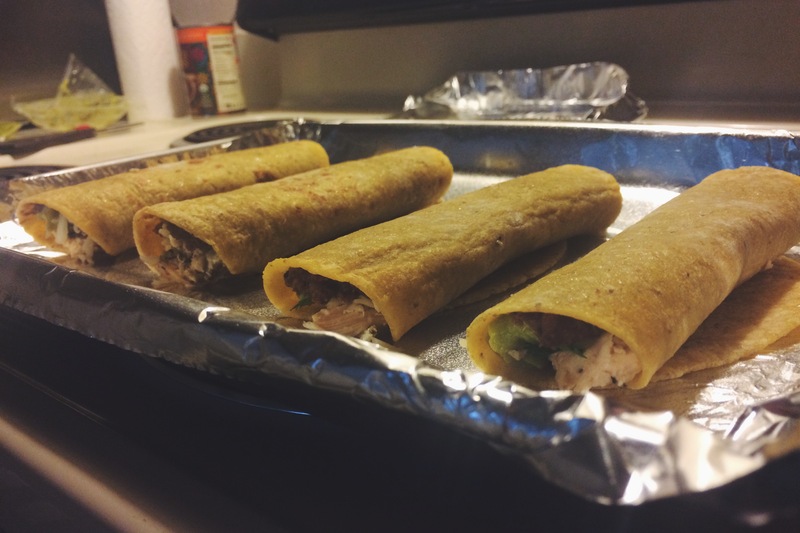 Roll up your taquito and place it on a greased baking sheet. Repeat with the remaining tortillas, placing them all on the baking sheet. Use two sheets if you need to. Keeping them spaced apart on the pan, so the entire thing crisps up, spray lightly with cooking spray, I used olive oil mist. Place them in a 425 F degree oven for 15-20 minutes until crispy and browned across the top and sides. The filling will have bubbled out just a bit, too. Serve with salsa or sour cream that has been spiced up with some cayenne pepper. I could only eat 2 until totally full and completely satisfied. Wow. This meal was a win. 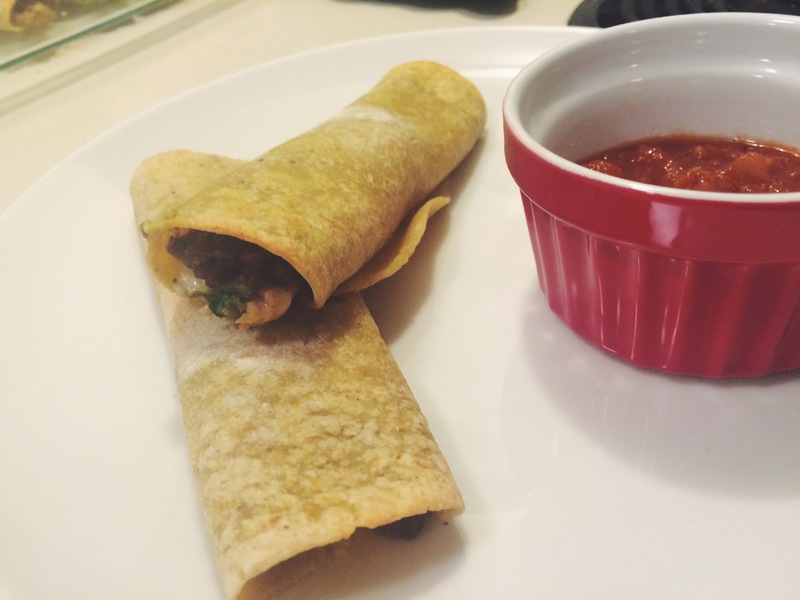 Any leftover taquitos, if there are any, can be reheated easily. You can microwave them but for best results reheat them in either a toaster oven or your kitchen oven. My reheat method: Warm them slightly for 45 seconds to 1 minute in the microwave. Transfer them to a lined baking sheet and bake under the broiler at 425 for 3 minutes and at “broil” temp for another 2-3 minutes until crispy again.